Shuckin' Shack #11 Prepares for an October Opening! It was only a few months ago we shared the news that our Durham, NC franchisee, Phil Yong, had received the permits to begin construction of his new restaurant space at 2200 W. Main Street - Suite A140 in the Erwin Square neighborhood. Last month we followed up an in-progress photo and blog update on that location. Now in September, things are clearly coming together for Phil and some of his staff members as they prepare to open their Shuckin' Shack Oyster Bar in October! 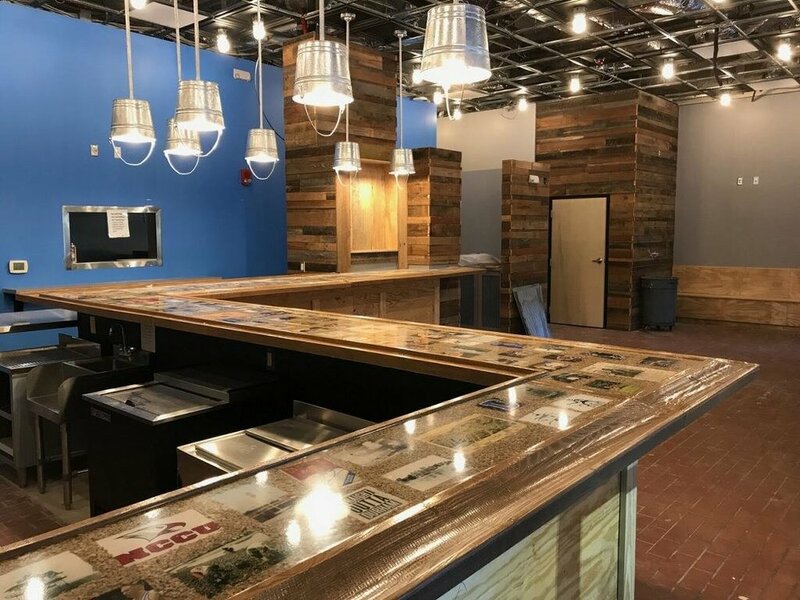 According to Shuckin' Shack CEO, Jonathan Weathington, the Durham franchisee has already completed preliminary training over the past few months and can expect our operations team to be on-site within the next few weeks to help train his new employees. According to Weathington, "most new Shuckin' Shacks employee just 10-15 full-time and part-time employees" - significantly less than similar sports pubs and seafood restaurant franchises, keeping staffing headaches and overhead low. We encourage any local residents or visitors to Durham, NC to join the 1,000 people already following their Facebook page to stay up-to-date on hiring opportunities and when to expect the official opening next month! If you have an interest in bringing the Shuckin' Shack Oyster Bar & Sports Pub to the Greenville-Pitt County marketplace in 2018, please visit our available opportunities page to watch our brief introductory video and request additional details! Disclaimer: The information found on this site is not an offering to sell a franchise, it is for informative purposes only. Shuckin' Shack Franchising will not offer the sale of a franchise to a resident of any state without first abiding by the applicable state registration laws (if necessary). Additionally, franchise sales are only offered though the Franchise Disclosure Document (FDD), in accordance with the FTC and state laws concerning the designated time period for sales. Currently, the following states in the United States regulate the offer and sale of franchises: California, Hawaii, Illinois, Indiana, Maryland, Michigan, Minnesota, New York, North Dakota, Oregon, Rhode Island, South Dakota, Virginia, Washington, and Wisconsin. If you reside in one of these states, or even if you reside elsewhere, you may have certain rights under applicable franchise laws or regulations.